A couple of months ago I realised that I had the Scottish Episcopal Church youth camp approaching, for which I was requiring a PC to work on the daily ‘newspaper’. With various other web-based projects on the go and looming I thought it about time that I invested in a laptop or notebook computer. When I told people that I’d bought a new laptop quite a few said “Wow! Well if you bought it then it must have a really impressive spec.” Which was quite flattering, really, but totally wrong. Because I believe in buying hardware that is appropriate for the job. My first question is always: what do I want it to do? If all I want is something that will allow me to do basic office tasks, some Web browsing and maybe a little graphics manipulation and Web development (which is what I wanted it to do) then I certainly wouldn’t buy the latest shiny desktop-replacement laptop with full DirectX 9.0c 3D graphics and a dual-core, 64bit CPU with enough processing power to take half the human race to the moon and back. What I would buy, however, is something that will allow me to do basic office tasks, some Web browsing and maybe a little graphics manipulation and Web development. It’s the same reason that I still use a Psion PDA and haven’t ‘upgraded’ to a Windows Pocket machine. That and the politics involved, and the GUI, and the Geek Factor! So after much deliberation, research, asking friends for their recommendations, and some good old fashioned bargain hunting I finally settled for the Lenovo 3000 C100 for a very reasonable £359.99 inc VAT. Lenovo is the largest PC manufacturer in the People’s Republic of China, and the third largest in the world following its buy-out of IBM’s PC division. They currently have two ranges of notebook: the ThinkPad range (essentially a rebranded IBM ThinkPad) and the 3000 range, of which this is the most basic model. This model really has a surprising number of features for a laptop of this price. The case is plastic, but pretty strudy. The lid is an attractive silver colour — which fooled me into thinking that it was metal for a couple of weeks until a more careful inspection proved otherwise. The rest of the machine is a dark brown colour, which looks black in certain a light (night-time!). Access to battery, memory and hard disk is from beneath using nothing more than an appropriately-sized Philips screwdriver. It took me seconds to install a second 256MB SDRAM memory module. The front edge of the Lenovo 3000 C100 is very simple, housing only the DVD-ROM/CD-RW combo drive and three light indicators: power, battery and WiFi. The location of the DVD/CD drive is often a matter of personal taste. Some prefer it at the side, others prefer it at the front. Personally I’m not bothered by it, except for those few occasions when I accidentally hit the bright orange eject button with my thumb when moving the machine. The left-edge sports the following connections (from rear to front): modem, power input, USB #1, headphones, microphone, WiFi on/off switch, left speaker. Looking at the machine from the rear, from left to right: IEEE1394 (FireWire), LAN 10/100 Ethernet, USB #2 and #3, VGA-out, S-Video out, USB #4, fan. The right-hand side of this laptop houses only the PCMCIA (PC Card) slot and beneath it the 3-in-1 card reader, supporting Secure Digital (SD), MultiMedia Card (MMC), and MemoryStick (MS). The keyboard is first-class. I usually struggle with laptop keyboards but this one is really comfortable to use. My only niggle is the location of the Fn key, which sits to the left of the Ctrl, as I keep accidentally hitting Function instead of Control — I would have much preferred Ctrl – Win – Alt – Fn. As well as the usual 85-key laptop keyboard the keyboard area is kept simple with the inclusion of only three more keys: Power (on/off), Lenovo Care and Mute. The Lenovo Care button is used during a boot-up to access the System Restore utility, and during normal Windows use to access laptop-specific help. To the right of these extra keys are five LEDs: hard drive use, SD/MMC/MS card, Caps Lock, Num Lock and Bluetooth usage. One complaint I frequently met while researching this latop was the quality of its touchpad and associated buttons. The main criticism was that the touchpad buttons didn’t have enough travel, but to be honest I’ve found both to be perfectly usable and comfortable to use, with plenty of space in front of the keyboard to rest your palms. It took me a while to work out that that by dragging down the right-hand side of the touchpad and along the bottom of it I can control page scrolling. While some laptops have this area marked to aid users, I had to find this out by myself after my mouse-pointer kept suddenly changing to what looked like a scroll-bar with a mouse. Some heads-up about this in the accompanying documentation wouldn’t have gone amiss. That said, for prolonged use I plug in a USB mouse. I tried using a mini laptop mouse, but I found that more uncomfortable than using the touchpad, so I’ve reverted to a full-size desktop mouse instead. The screen quality is very good, and is remarkably bright. To save battery I usually turn the screen contrast down, which still makes it usable indoors. The default maximum resolution of 1024 × 768 pixels is usable, although I do miss my usual resolution of 1280 × 1024. According to the Lenovo site this laptop will support a maximum resolution of 2048 × 1536 “with max video RAM”, although I’ve yet to discover how to do this. Like most budget laptops the onboard sound quality is not great. The built-in speakers are located on the left and right sides of the case towards the front of the machine. It is usable, it is adequate, but if you want to listen to music or watch a DVD for a prolonged period then I thoroughly recommend external speakers or headphones. Headphone and microphone sockets are located to the left of the keyboard and while clearly labelled colour coding them (green for headphones, pink for microphone) would have made them much easier to distinguish. Having mostly used Psion PDAs I’ve been spoiled when it comes to battery life. The 3mx and 5mx last about a month (about 40 hours of use) on a pair of AA batteries, the Series 7/netBook lasts around 8 hours. Lenovo claim around 4 hours on a single charge, and so far I have been fairly close to that. Thie BIOS is accessed at boot-up time by pressing the F1 key. This laptop has a very simple BIOS (Insyde Software SCU) with very few user-adjustable options. There are only five categories: Main, Advanced, Security, Boot and Exit, but it does give up some useful information such as model numbers for the hard drive and DVD/CD, and serial numbers for the model, system and motherboard. In terms of speed and my general impressions of the machine, I am impressed. I’ve had it most doing fairly basic office tasks, the most demanding of which was coping with graphics-heavy publications in Microsoft Publisher. The only thing that it struggled with was playing MP3s while downloading 5.1 megapixel images from an xD card via the PCMCIA slot. The audio was very stuttery during such a heavy data transfer; so much so that I simply paused iTunes until the files had been copied to the laptop. Other than that it has coped very well with whatever I’ve thrown at it, including running the XAMPP (Apache, MySQL and PHP) server. Watching DVDs has been very good, using the pre-installed InterVideo WinDVD 5. Playback was smooth, the picture was clear and with external speakers or headphones the audio was clear. Ripping to MP3 is done simply and without a fuss, and I’ve even managed some basic video editing using Windows Movie Maker 2. Switching WiFi networks can be managed easily with the built-in Broadcom Wireless Utility which is a nice feature. The inclusion of built-in WiFi, Bluetooth and 4 USB ports make this a very attractive laptop computer for the price. A larger screen resolution, more hard drive space, 1GB of memory and a DVD-rewriter would have been great but for this price you still get more than what you pay for. If you can put up with a few niggles, such as the location of the CD/DVD drive and the Fn key, this is a very good, sturdy laptop with the most comfortable laptop keyboard that I’ve ever used. All in all I can’t complain: it does what I need it to do, and you can’t ask for more than that. A missing quote mark in the HTML link code meant that the price was omitted, but still visible to me on the back-end. Sorry about that. It’s displaying okay now, and was a fine Â£359.99. I’m in the process of advising my parents-in-law in the process of buying a new computer, and they’re still trying to make the laptop/desktop choice… A 15″ screen is probably what they’re after, so this looks quite a good option. The case is plastic, but pretty strudy. Without doubt a Mac laptop is best (as a recent convert!) however I have to agree that Thinkpads are rather the most excellent Windows laptops ever! And if Lenovo carry on their good work, all should be well. Very well. Nice article… could you possibly confirm whether the laptop has built-in mic, as I’m thinking of purchasing the same model? No built-in microphone, but there is a mic input on the left-hand side of the laptop, next to the headphones socket. I use a Phillips mic/earphones for use with Skype which is perfect — it looks like a mobile-phone hands-free kit but is obviously for the PC. 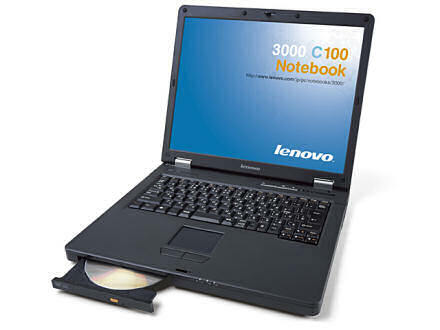 Hi, read your review AFTER ordering the Lenovo 3000 C100. I’m now reassured that I haven’t gone and bought something horrid and nasty. Goes to show what a lousy researcher I am. Looking forward to receiving the notebook on Monday. Your review is very good and hopefully will help others in deciding whether or not to order one of these notebooks. Does anybody know of any good laptop bags to buy? I wanted something a bit more exciting, I’ve heard of crumpler, does anybody know if there anygood? I found some at Blueunplugged. I am using this Lenovo 3000 C100 more than last one year . Its quite good performance . But I suspect the battery life. some times its battery dischage quickly. otherwise its quite good. Previous Previous post: Edinburgh, Edinburgh and … erm, Edinburgh!